ST. LOUIS – Webster University was awarded a $124,000 National Science Foundation Noyce Capacity-Building grant to encourage talented science, technology, engineering and math (STEM) majors to become math and science teachers in high-need Missouri K-12 schools, addressing a critical need in the state. The grant also will help Webster prepare to apply for a Robert Noyce Teacher Scholarships and Stipends grant, which would allow Webster to administer scholarships to teacher candidates majoring in a STEM field. The new program created by the grant – Webster’s Educating STEM Teachers Bound for Success (WESTbound Success) – will be jointly administered by faculty in the College of Arts & Sciences and the School of Education, in collaboration with faculty from the Department of Math & Computer Science in the George Herbert Walker School of Business & Technology and numerous community organizations. The program starts on April 1. The WESTbound Success grant team worked and consulted with various community partners in writing this grant, including St. Louis Community College, Forest Park; Ritenour School District; the Academy of Science, St. Louis; and the Urban League. Representatives from these organizations will serve on an advisory board at Webster University to guide the development of new programs and resources funded by the grant. Tony Wallner, dean of Webster University’s College of Arts & Sciences; DJ Kaiser, associate dean of Webster University’s School of Education; and Ravin Kodikara, assistant professor in the Department of Biological Sciences, will serve as the primary investigators for WESTbound Success. Martha Smith, professor and chair of the Department of Math & Computer Science; Victoria McMullen, professor in the Department of Teacher Education; and Jennifer Bond, adjunct professor in the Department of Teacher Education will act as key faculty collaborators on the grant team. Teresa Alvarez, chair of Biological Science at St. Louis Community College - Forest Park, served as a key collaborator with Webster University in pursuing this grant. She will chair the advisory board to provide additional guidance on how the grant can meet the needs of incoming transfer students. At the end of the program, Webster will apply for the Robert Noyce Teacher Scholarship Program Grant, which if successful, would provide scholarships for juniors and seniors that major in a STEM field and seek teaching certification in the state of Missouri. The work completed for the WESTbound Success grant will lay the groundwork to meet the conditions of the Robert Noyce grant. For more information about the College of Arts & Sciences, visit http://www.webster.edu/arts-and-sciences/. 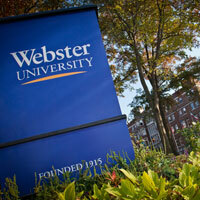 For more information about the School of Education, visit http://www.webster.edu/education. This grant is supported by NSF award DUE-1851969.